Figure 5.1. Growth in spaceway routes. Future space infrastructure envisioned by Dr William Gaubatz, if enabled by a space transportation system and in-space operations system to support the infrastructure. 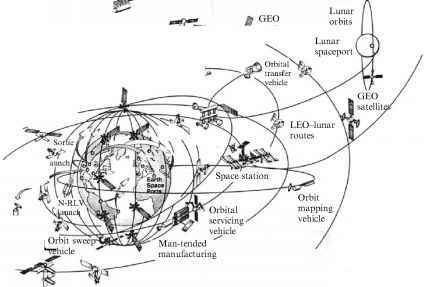 Assuming the capability existed for sustained space launches to establish an operational near-Earth orbit space infrastructure, there are serious performance and propellant refueling challenges that need to be immediately addressed. 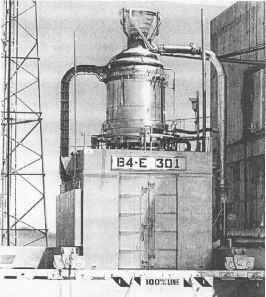 Because of the activity required by the elements of the near-Earth orbit infrastructure, the quantity of propellant required in space and, more importantly, the quantity of launcher propellant required to lift that very propellant into low Earth orbit (LEO) is truly prodigious, unless a non-chemical rocket is used. For a true space transportation system to exist, a transportation system network has to be built, just as it was for the United States transcontinental railroad. Dr William Gaubatz, formerly of McDonnell Douglas Astronautics (and former director of the Delta Clipper program) attempted to anticipate what the future might hold, if a space transportation system actually did exist, as shown in Figure 5.1. Dr Gaubatz shows the elements necessary to build the infrastructure, but unfortunately does not address the assets required to establish and sustain that infrastructure. Table 5.1. Space infrastructure vehicles and missions, from Figure 5.1.